That’s right: the home of pristine fiords and glaciers, verdant forests, stunning mountain scenery, cruise-ship-happy tourists…has a problem with coal dust. 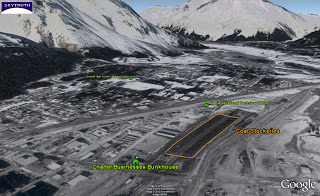 A relatively small amount of coal is mined in Alaska right now, but a lot of it ends up in big stockpiles in the coastal city of Seward, awaiting shipment to Asia and South America. Alaska can be a pretty blustery place, so dust blows off the coal piles and into town, and into the lungs of local residents. It’s not a good thing to be inhaling, so environmentalists just filed suit to force corrective actions. 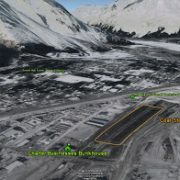 We’ve created a gallery of images to give you a virtual tour of Seward and these massive storage piles, using high-resolution imagery in Google Earth that was acquired in March 2007. At that time the twin storage piles were a quarter of a mile long and covered almost 8 acres.